You don’t need to go to an orchard to get this delicious mix of goodies. Taffy Town’s Orchard Picks mix is the perfect late summer treat that includes Fresh Apricot, Golden Pear, Green Apple & Juicy Cherry flavors. Packaged in attractive jars with a tin lid embossed with our Taffy Town logo, this delicious taffy makes a great gift or souvenir. 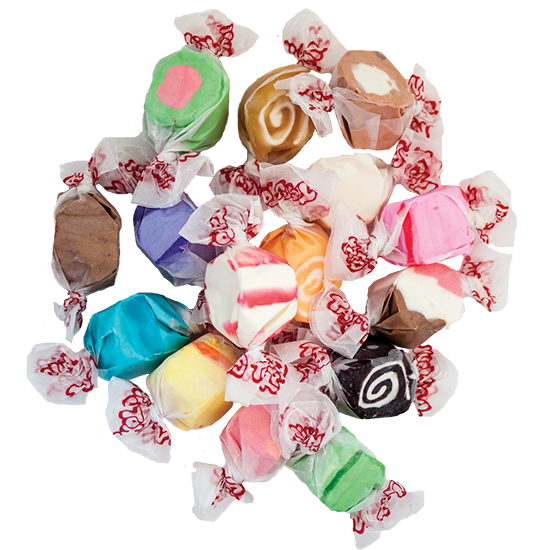 For over 100 years, Taffy Town has been manufacturing gourmet Salt Water Taffy. It is a delicious whipped taffy that melts in your mouth with a wide variety of true to life, unique and amazing flavors. Our taffy is Made in the USA in a batch process, using the best ingredients and flavors we can find. Our factory is free of tree nuts, peanuts and gluten. All our products contain egg whites and milk in for a creamy, melt-in-your-mouth taste and texture that is without comparison. Taffy Town, Inc. is a family owned and operated company located in the Salt Lake City area of Utah. Each taffy piece is twisted in a wax wrapper and has the trademark red Taffy Town lettering to help our ever-growing fan base identify our product wherever it may be sold. It’s a colorful product with individual wrapping to make it easy to use in candy buffets, holiday treats, summer snacks, party goody bags and more. It is a fun medium to use for creative decoration projects and crafts for both children and adults. Order yours today and get this tasty candy fresh from the factory!